This is a very important conference!!! Freedom of speech and expression are recognised by many as primary human rights. However, when it comes to discussion on topics concerning Palestine, Israel and Germany we often face rigid and concrete boundaries that clearly suppress free and creative discourse. We somehow grasp what we are allowed to say but are also conscious of a variety of thoughts we better keep unsaid. Yearning for humanism and willing to bring a change about, the conference seeks to liberate the contemporary ideological, spiritual, cultural and political discourse. We will try to identify the mechanisms that stifle freedom of speech, with the hope that sometime soon, we will be able to say what we think and to mean what we say. 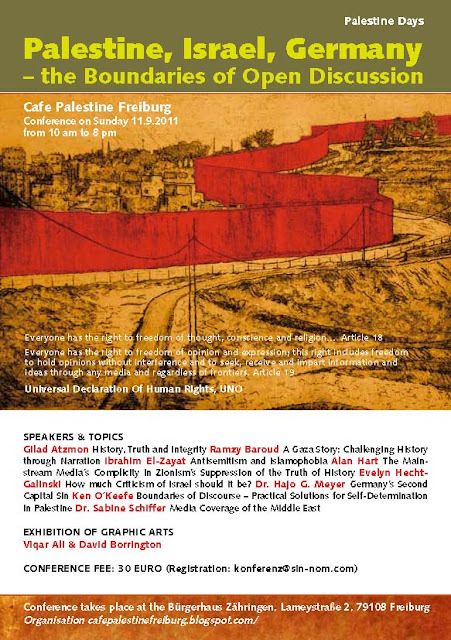 The conference 'Palestine, Israel and Germany - Boundaries of Open Discussion' will elaborate on some 'contentious' topics such as suppression of truth, history, narration, mainstream-media complicity and media coverage, Islamophobia, anti-Semitism vs. criticism of Israel and responsability. We will also try to show practical solutions for Palestinian self-determination. Evelyn Hecht-Galinski How much Criticism of Israel should it be?